Our Documentation centre is well filled with visual material, a comprehensive collection of laws, instructions and circulars, registers, customs tariffs, records of service and proofs of appointment, etc. The oldest documents date from the period of the Austrian Netherlands (18th century). The staff of the Working group Documentation centre is constantly working to make archive material available for the broad public. A survey of the records of service and proofs of appointment that is managed by us, can now be found on the website. You can also find information on the ranks of customs officers and excise officials in the year 1923. 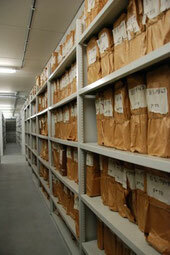 Staff records in particular may offer a wealth of data for genealogists. If you wish to consult archive material, please make first an appointment with the secretariat by telephone to 0032(0)257/78000 or by e-mail to douanemuseum@gmail.com. We also have a library containing about 1,000 works on various border aspects and the functioning of Customs and Excise. Furthermore, we offer a number of publications which we published ourselves or which were the result of a co-operation with other partners.